Can a Guardian or Trustee File a Lawsuit on Behalf of an Individual with Special Needs? 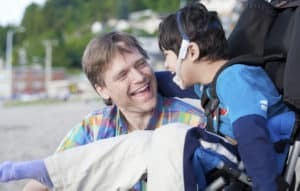 An individual with special needs may need a guardian or trustee to file a lawsuit on his behalf. If it makes sense to file a lawsuit under the circumstances, the individual with special needs or relatives will need to determine if someone else is the correct person to go to court. Illinois and federal law recognize concepts called “standing to sue” and “capacity to sue”. People who have been found by an Illinois court to be legally “disabled”, resulting in appointment of a guardian, do not have capacity to sue because of the “disabled” designation. Instead, a guardian, guardian ad litem, or “next friend” represents their interests in court and files lawsuits on their behalf. These people have standing to sue because the court recognizes their ability to act for the person with special needs in legal proceedings. If a person is declared legally disabled during the course of a lawsuit that he or she filed, one of these people will maintain the lawsuit on the person with special needs’ behalf. The court may appoint a guardian ad litem to represent the interests of a person with special needs in a lawsuit. Usually, guardians ad litem only act for people with special needs in their own guardianship proceedings, but the court can appoint them for other purposes as needed. Alternatively, the court may appoint a “next friend” to pursue the lawsuit. The term “next friend” refers to a person who files or defends a lawsuit on behalf of a person with special needs. Next friends are different than guardians because they are not parties to lawsuits. They have no power to act for people with special needs besides bringing or defending a lawsuit, or otherwise representing people’s interests in court. People with special needs who have trusts could need to sue someone who injured the trust or its beneficiaries. For example, if a financial adviser hired to work with trust assets takes some of the money for his personal use without permission, the beneficiary could lose money. However, the beneficiary cannot sue the financial adviser. Only a trustee, not beneficiaries, has that power. If you are in this situation, you need to speak to a lawyer immediately to figure out your options.